Marxan software and its advanced version Marxan with Zones, developed by the University of Queensland, were implemented and applied to the Adriatic-Ionian Region (AIR) and to the subarea of the Italian Emilia Romagna Region (RER). The analysis covered different planning scenarios for the prioritization of biodiversity conservation in the AIR, combined with sustainable development of aquaculture in the RER subarea. Achieved results can support spatial planning process in the AIR and the RER subarea, providing scientifically-based scenarios for stakeholders discussion and decision making. Marxan tool is freely available at marxan.net. ; results of Marxan application to the Adriatic Ionian Region and Emilia Romagna Region are described in details in: Gissi, E., McGowan, J., Venier, C., Di Carlo, D., Musco, F., Menegon, S., Mackleworth, P., Agardy, T., Possingham, H. (2018). 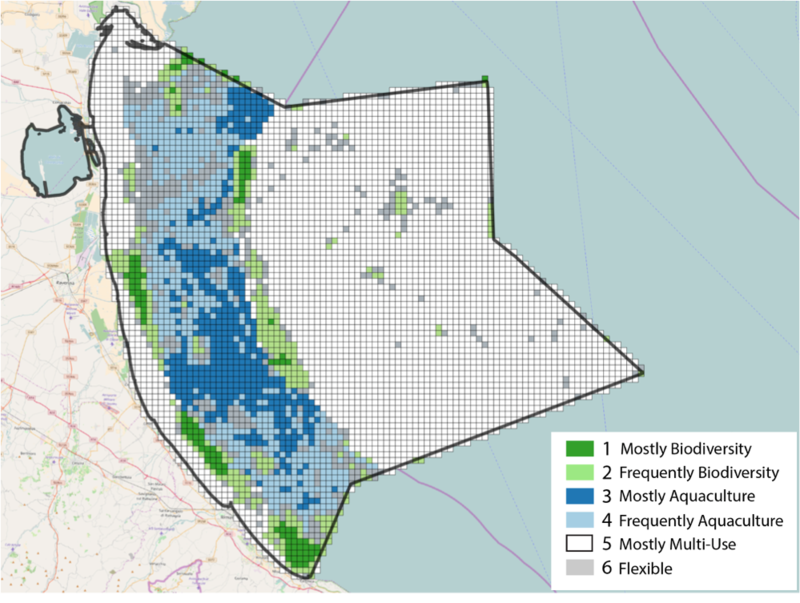 Addressing transboundary conservation challenges through marine spatial prioritization. Conservation Biology. DOI: 10.1111/cobi.13134. What are the priority sites for biodiversity conservation in the Adriatic-Ionian Region (AIR) according to different scenarios of collaboration among countries? Which maritime uses are most affected by conservation in the AIR? How can spatial prioritization be used to combine biodiversity conservation and aquaculture development objectives? Where aquaculture and biodiversity conservation objectives can coexist? How can impacts on other maritime uses be minimised? Marxan is one of the most widely used decision support software (DSS) for conservation planning. Within the Ritmare project and with the support of other projects (Adriplan, Supreme, Erasmus Mundus Master Course on MSP), Marxan and its advanced version Marxan with Zones were applied to the Adriatic-Ionian Region for biodiversity conservation and to the subarea of the Italian Emilia Romagna Region with a specific focus on achieving the goals of sustainable development of aquaculture activities and biodiversity conservation. Supporting spatial planning process in the AIR and RER. Following the identification of the two study areas (the AIR and the nested RER subarea), the definition of their relative main characteristics (on the basis of the results of the DG-MARE funded ADRIPLAN), current needs and priorities and the identification of specific aims of the analyses, two different methodologies were applied for the implementation of spatial prioritization through MARXAN, respectively for the AIR and the RER scale. Definition of the input information for Marxan: conservation features (environmental components), costs (density of maritime uses) and targets (30% according to IUCN World Conservation Congress in Hawaii (2016) and 10% according to Aichi Biodiversity Target 11 defined in the frame of the Convention of Biological Diversity). Collection and processing of spatial data (biotic and abiotic components) already available from the Adriplan Data Portal. Creation of the planning grid required for the analysis: subdivision of the analysis domain in square sized planning units of 10km x 10km (3,366 planning units in total). Creation of the input dataset for four planning scenarios according to the following hypothesis: a) targets set across the entire AIR; b) targets set for each country; c) cost equal to the area of each planning unit; d) cost equal to the density of maritime activities. Spatial prioritization by running Marxan. Validation, calibration, sensitivities and gap analysis. Post-hoc analysis and discussion of zoning scenarios: evaluation of the priority areas for conservation by means of statistical analysis (e.g. protection equality, according to Chauvenet et al. 2017). Definition of the input information for Marxan and Marxan with Zones implementation: conservation features (environmental components), costs (aquaculture profitability, computed as a function of the distance from ports; density of maritime uses and density of maritime uses in conflict with aquaculture) and targets (30% according to IUCN World Conservation Congress in Hawaii; 2016). Creation of the planning grid required for the analysis: subdivision of the analysis domain in square sized planning units of 1km x 1km (5,256 planning units in total). Spatial prioritization for biodiversity conservation by running Marxan. Validation, calibration, sensitivities and gap analysis for Marxan outputs. Building the input dataset for running Marxan with Zones to simultaneously zone biodiversity conservation and maximize the profitable expansion of aquaculture. Validation, calibration, sensitivities and gap analysis for Marxan with Zones outputs. Development and discussion of zoning scenarios. Priority areas for conservation changes significantly when considering costs (density of maritime uses) or ignoring them. The analysis of the 10 best scoring conservation plans for each scenario highlights that setting targets at national level influences more the total area of conservation than setting targets for the whole AIR. The protection equality analysis shows that planning at the AIR scale without considering costs produces the most unequal plans for both countries and impacts on maritime uses for all scenarios. Biodiversity Zone with the aim of conserving biodiversity: in dark and light green the planning units with the highest selection frequency for biodiversity conservation. Aquaculture Zone with the aim of identifying priority sites for aquaculture: in dark and light blue the planning units with the highest selection frequency for aquaculture prioritization. Multiple-Use Zone (in white) with the aim of “conserving” all the other maritime activities in the region, such as tourism, maritime transport, commercial and small scale fishery, dumping area for dredging, military areas, off-shore sand deposit, oil and gas research and exploitation. Moreover, cells in grey in the figure visualize planning units considered “flexible” as do not show preference in the selection frequency for any particular zone. In general both the analysis at AIR and RER scale can support multiple stakeholders discussion and decision-makers towards cost-efficient solutions that are scientifically based, thus contributing to the marine spatial planning process and sustainable growth in the RER and in the wider AIR. The Marxan software and its advanced version Marxan with Zones are freely downloadable at the website www.marxan.net. Its application to the Emilia Romagna Region and the wider AIR can be used as an inspiring practice for similar implementation in other marine area. The Adriplan Data Portal, collecting and displaying spatial data for the whole Adriatic Ionian Region in particular supports its transferability to other subareas of this region. The use of Marxan and Marxan with Zones requires skilled expertise and resources. Moreover, it relies on wide data input; if not supported by dedicated projects (as Adriplan in this case) data collection and structuring can be time and resource consuming activities. Marxan scenarios depend on set assumptions (as in the case of any DSS); results of the software application should be considered as starting points for stakeholder discussion and decision making, rather than scientifically-based decisions. Funding Source: Marxan implementation in the Adriatic Ionian Region and in the Emilia-Romagna subarea was funded through different projects: the RITMARE Flagship Project (a National Research Programme funded by the Italian Ministry of University and Research); Supreme (funded by EASME – EC DG MARE), Adriplan (founded by EC DG MARE, Erasmus Mundus Master Course on MSP – EMMCMSP (funded by the Education, Audiovisual and Culture Executive Agency). Costs: not possible to be defined, as part of the overall funds to the RITMARE, SUPREME, ADRIPLAN, EMMCMSP projects. Chauvenet, A. L., Kuempel, C. D., McGowan, J., Beger, M., & Possingham, H. P. (2017). Methods for calculating Protection Equality for conservation planning. PloS one, 12(2), e0171591.